Paths for Communities 7 at Marston MoretaineWalking RouteLeaving the Forest Centre, travel by train to Bedford St John's station, then walk or cycle through Bedford's floodplain to Priory Country Park, the Grange Estate and the village of Willington, all of which form part of the Bedford River Valley Park. The Forest Centre is just off the A421 at Marston Moretaine and is only a few minutes from Junction 13 of the M1. Just follow the brown tourist signs marked Forest Centre. 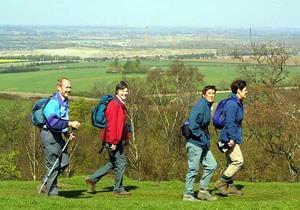 This circular walk starts from the Forest Centre at Marston Moretaine. Leaving the Forest Centre, travel by train to Bedford St John's station, then walk or cycle through Bedford's floodplain to Priory Country Park, the Grange Estate and the village of Willington, all of which form part of the Bedford River Valley Park.